New in this expanded 3rd edition of Gold Coins of the Charlotte Mint is up-to-date information on rarity estimates, surviving specimens, and condition census. This book analyzes each issue for Strike, Surfaces, Luster and Color. Douglas Winter also offers his personal expert advice and observations, and a brief overview of die varieties for all C Mint Gold Dollars, Quarter Eagles and Half Eagles from 1838 to 1861. His latest work is complete with the history of the Mint and hundreds of full color gold coin images. 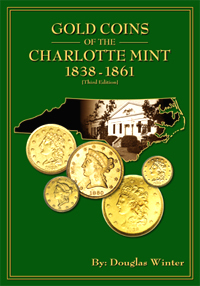 This book is a gem that goes hand-in-hand with the Charlotte minted gold coins themselves.